In its first approach to working with residential developers, Le Sueur may create a storm water retention pond on 7.5 acres off Kingsway Drive. 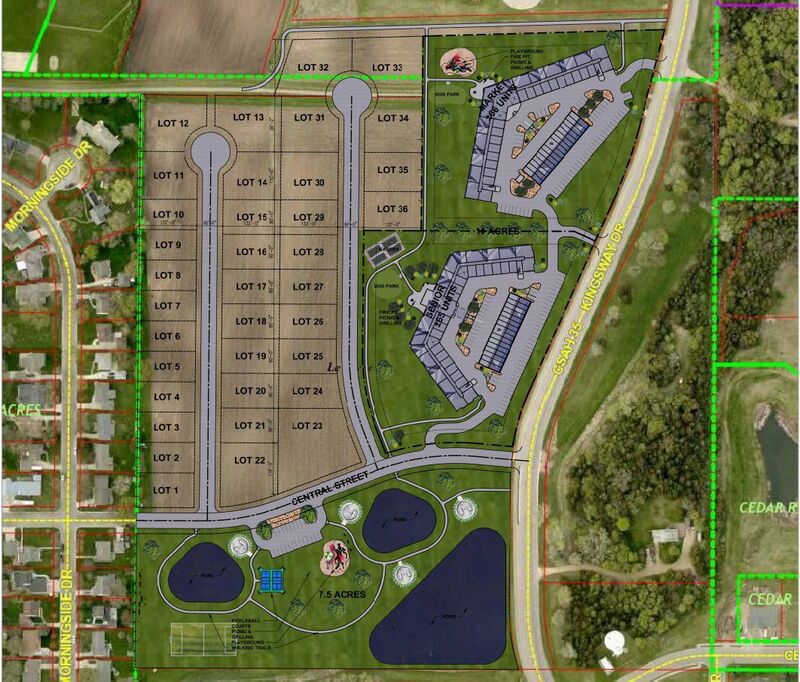 The pond would be the city’s portion of a three-way deal with the Le Sueur Economic Development Authority and INH Properties that could bring around 30 new housing lots and up to 131 apartment units to the city. City Administrator Jasper Kruggel explained that the city’s portion of the deal would consist mainly of developing storm water ponds and a potential park around them. The ponds would be located to the south of the potential development along Kingsway and would connect to an extension of Central Street that would reach to Kingsway. “The city has been in discussion with the owners of this property for a very long time regarding the storm water drainage swale that goes through their property,” Kruggel said. He said that the area is not designated as a stream or waterway by the Department of Natural Resources because there isn’t water there all the time, just seasonally. “It drains a lot of the city,” Kruggel said. Because the city has had many discussions about this with the property owners, this project was budgeted for in the capital improvement plan for 2019. “We didn’t know, but we wanted to make sure we had the funds available if this came up,” Kruggel said. Currently, INH Properties and the EDA have worked out an agreement for the land. INH would buy the total 36.5 acres of land and would retain 10 acres of it in order to develop two possible apartment complexes — one senior living and one regular market — while the EDA buys 19 acres of it for single-family housing development and the city is looking at the other 7.5 acres. The total price for the nearly 37 acres was set at $914,500 by the property owner and the EDA and city would each buy their plots from INH for a little over $25,000 per acre. The ponds would potentially be developed using Tax Increment Financing (TIF) funds. If the project all works out, some of the parcels of land will need to be rezoned as they are all currently zoned as R-3 or high-density housing. Rezoning was where INH Properties ran into trouble with its last attempt to develop in Le Sueur. Last August, INH pulled a similar proposed development that was supposed to be put on Distel Avenue. INH decided to pull their proposal due to citizen complaints and a denied request for rezoning from the Planning Commission and the city. But the developer, city and EDA are hoping that the new area will end better. For the city’s portion, the council would need to develop their portion of the land by creating the ponds and possibly adding park amenities as well. Mayor Greg Hagg asked Kruggel how much it might cost to do this and he said the “high-level estimate” is between $500,000 and $750,000. “But we could potentially get some of that initial money back” because the houses and the apartments are going to need storm water storage, Kruggel said. Either way, Kruggel and some of the council members seemed to be excited about the possible project. “It’ll be nice to have some kind of park in town that has a water feature that isn’t something that is under water all the time,” council member John Favolise said. By the end of the discussion, the council agreed to allow Kruggel and Le Sueur Community Development Director Samantha DiMaggio negotiate the purchase agreement with INH Properties, which will be brought back to the council as soon as the next meeting on April 22.